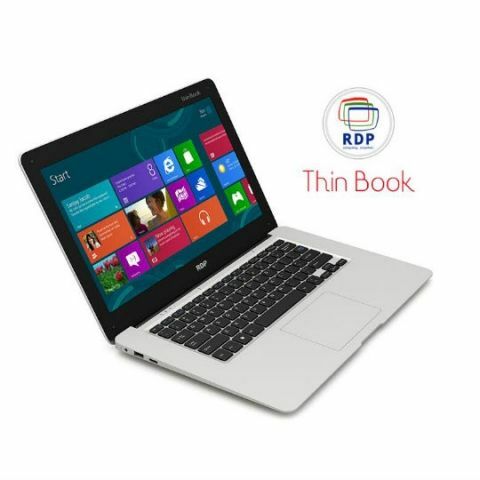 RDP has launched its Thin Book laptop at Rs. 9,999. The device features a 14.1-inch display with a resolution of 1366 x 768 pixels, and is powered by an Intel quad-core processor with 2GB of RAM. It offers 32GB of storage that can be expanded by up to 256GB. Those interested can pre-book the device via the company’s website. RDP India’s leading it hardware manufacturing company has officially marked its entry into laptop segment by announcing the launch of “Thin Book” the new ultra slim laptop in India at a budget price of 9999/-. Thin Book is a 14.1 inch display offering a resolution of 1366 x 768 pixels. Company claims Thin Book is the world’s first ultra slim laptop in this price segment for Indian consumers mainly for on the go users. The RDP Thin Book is a "revolutionary" design with glossy fiber & elegant edges as per ergonomics, the windows 10 based laptop is powered by Intel quad core processor with 2gb ram & 32gb storage (expandable upto 256 GB). Graphics are provided by an integrated intel hd graphics and the system also includes a web camera and connectivity is supported by Bluetooth 4.1 and integrated 802.11a/b/g/n/ac. The laptop is backed by a 10000 mAh 3.7 v battery as well. On the launching occasion company spokesperson said “ Thin Book really makes the differentiates from its competitors with its killing & aggressive price. Thin Book is targeted for all kind of business users who wants to continue their productivity on the move as well as for the Tier 2 & Tier 3 cities who have not tried a laptop simply because it was too expensive. Besides that he also stated that this Thin Book is for “comfort and productivity”, with this aggressive pricing, we want to create a disruptive product, which we hope will expand the PC market as well, and not just increase our market share. We’re also offering quality after sales with the strategy of 24/48 hours support resolution by alliance with Global leaders in business outsourcing. We are actively working towards addressing the requirements of every genre of computing which includes entertainment, personal and official. Our latest launch of Thin book is aimed at aiding modern businesses and their computing requirements. It enables users to work without worries and personifies our promise to inspire and power businesses.